The Suns are back and have their sights set high this upcoming season. This new look Phoenix team will attempt to make some noise in the Pacific division and bring home an NBA championship. Division rivals, the Los Angeles Lakers and the Sacramento Kings will battle to prevent the Suns aspirations. Grab your Phoenix Suns tickets and head down to the Talking Stick Resort Arena and help lead your team to victory. The Phoenix Suns have enjoyed a lot of success since their formation forty-nine years ago in 1968. So far, the team has qualified for the playoffs twenty-nine times and has also made a total of nine trips to the Western Conference Finals. However, their performances in recent years have not been up to the mark and this has got their fans a little concerned. In the 2017-18 season, the Suns finished fifth in the Pacific Division. Let’s take a look at some of the greatest moments in Phoenix Suns history. Making their first appearance in NBA Finals – After going through a rough stretch in their initial years, the Phoenix Suns made it to the postseason in the 1975-76 season. They defeated the Seattle SuperSonics 4-2 and the Golden State Warriors, 4-3, in the Conference Semifinals and the Conference Finals respectively. They then locked horns with the Boston Celtics for the NBA Championship. The Suns played quite well but unfortunately came up short and lost, 4-2. Charles Barkley Shoots the Suns into the Western Conference Finals – During the 1992-93 season, the Phoenix Suns did everything right. In the Conference Semifinals, the team locked horns with the San Antonio Spurs. On May 18, 1993 at the AT&T Center, the Suns and the Spurs locked horns in Game 6. These two teams went back and forth and tied the score, 100-100. It looked like the game would go into overtime but in the last eleven seconds of the fourth quarter, Charles Robinson did something unforgettable. He took an inbound pass from Frank Johnson and then launched himself in the air to take the shot. The ball went through the net before time expired. This gave them the 102-100 lead and the Suns went on to face the Seattle SuperSonics in the Conference Finals. The Phoenix Suns have heated rivalries with the San Antonio Spurs and the Los Angeles Lakers. Suns-Spurs Rivalry – The Phoenix Suns and the San Antonio Spurs became rivals when the two met in the First Round of the playoffs in 1992. The former swept that series which infuriated the Spurs. One year later, these two sides locked horns again but this time in the Conference Semifinals. The Spurs once again came up short against the Suns. Since then, both teams have played each other on eight occasions in the postseason. The Suns and the Spurs last collided at the Mexico City Arena on 14 January, 2017. That game was won by the former, 108-105. 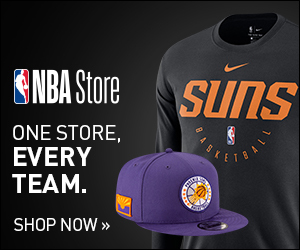 Suns-Lakers Rivalry – The Phoenix Suns and the Los Angeles Lakers are division rivals as both teams are members of the league's Western Conference Pacific Division. This rivalry started in the 1980s. That decade, the Suns and the Lakers collided five times in the playoffs with the latter winning on every occasion. The Suns later took their revenge in the 1998-90 season when they defeated the Lakers in the Conference Semifinals, 4-1. In the 1992-93 campaign, the Suns once again eliminated the Lakers from the postseason which added fuel to their already heated rivalry. Kevin Johnson is at the top of the list of the Greatest Players in the History of Phoenix Suns. He joined the team in 1998 and remained on the roster till 2000. During his time with the Suns, he played in three NBA All-Star Games. He was also honored with the J. Walter Kennedy Citizenship Award in 1991. In addition, the Phoenix Suns retired his number 7. Connie Hawkins is another star who played for the Suns from 1969 to 1973. During these years, he impressed everyone with his great performances and was selected to play four NBA All-Star Games in 1970, 1971, 1972 and 1973. He was also a part of the All-NBA First Team in 1970. Moreover, to honor him, the Phoenix Suns retired his number 42. Then there is, Walter Davis. He remained a part of the Phoenix Suns from 1977 to 1988. During this time, he was selected to play six NBA All-Star Games. Davis also received the NBA Rookie of the Year Award in 1978. In addition, he made it to the All-NBA Second Team twice in 1978 and 1979. Other than these stars, players like, Gus Johnson, Dennis Johnson and Shaquille O’Neal were also a part of the Suns. All of them have been inducted into Phoenix Suns’ Hall of Fame. Things haven’t been going well for the Phoenix Suns over the past few years. The last time, they qualified for the postseason was in the 2010-11 season. Will this year turn out to be any different for the Suns? Find out by grabbing your Phoenix Suns tickets 2018 and watch the Suns turn tables this season at Talking Stick Resort Arena. In the heart of the hopping entertainment district in downtown Phoenix, the Suns play in the Talking Stick Resort (formerly the US Airways Center). Opened in 1992, the arena has hosted two NBA All-Star Games, and tons of NCAA tournament games. This state of the art facility makes for a optimal location for a great night out in Phoenix. Our process for purchasing cheap Phoenix Suns tickets is simple and fast. There are so many online ticketing sites, that it can be hard for customers to find the right place to buy Phoenix Suns tickets at the cheapest price. At ScoreBig we think of our customers first and foremost. We offer daily deals for Phoenix Suns events, so our customers can get the best seats for the best prices. ScoreBig will always go above and beyond to offer the cheapest Phoenix Suns tickets on the market. The Phoenix Suns schedule above, displays all available events for 2019 and 2020. Once you find the event that you would like to go to, click the red “Get Tickets” button. It is located on the right-hand side of the event listing, it will take you to an Phoenix Suns event ticket page. ScoreBig's event ticket page will display all available Phoenix Suns tickets for that event. On the event ticket page to help with your search for the right Phoenix Suns tickets, use the filters at the top to select quantity, price range, and more. There is also an interactive seating chart so you can pick where you want to sit. When you are ready to buy a ticket, click on the listing, and you will be directed to ScoreBig's checkout page. Upon completion of the information fields, your order will be processed and your Phoenix Suns tickets will be delivered via email, mail, or to your mobile device. What makes ScoreBig’s site stand out from the rest? We are constantly analyzing our competitors to improve our site, service, and prices. ScoreBig.com employees strive to offer the best process and experience to buy cheap Phoenix Suns tickets. Our goal is to get you the best seats to Phoenix Suns events. We offer daily discounts on our site and for special promotions check out our newsletter. If there are no Phoenix Suns events currently available, you can use our search feature at the top of the page to see a list of all popular events going on near you. No matter your price point, we have all the best deals and discounts on Phoenix Suns tickets. For more information on prices of Phoenix Suns tickets and the schedule for Phoenix Suns, check out our listings above. The last thing you want to find out is when the Phoenix Suns event you wanted to go to is sold-out. Don’t worry in many cases ScoreBig has affordable tickets to sold out events. We sell tickets from GA all the way to premium seating and parking. Skip the scalpers in the parking lot and get your tickets online from top Phoenix Suns ticket brokers. We get you in all events, buy your Phoenix Suns tickets here from a brand that many trust and rely on for all their ticketing needs. ScoreBig offers a 100% money-back guarantee. If you have been in search of cheap tickets for Phoenix Suns, ScoreBig by far is the best option. That’s why ScoreBig has more loyal customers than any other ticketing site. Shop at ScoreBig for safe and secure Phoenix Suns event tickets.